A two-day FDP on “Quality Enhancement through 5S – KAIZEN – TPM” was organized on 3 and 4 January 2019. Around 20 participants from Production/Quality Engineers from Rambal Ltd., and Faculty from departments of Aeronautical, Automobile, Mechanical and Office of International Affairs, HITS participated. The Chief Guest, Mr. M. Gajendran, Asst. General Manager, Centre Quality – TQM, Ashok Leyland, Ennore, Chennai addressed the FDP on Kaizen activities, its role at various levels, and purpose of daily work management. Prof. K. Viswanathan, Dept. of Mechanical Engineering, HITS in his session threw some light on the 5S concepts, its methodology and the implementation of it in real life and at the work place. The participants were assigned group activities based on the 5S principle for the next day workshop. Prof. B. Prabakaran, Dept. of Automobile Engineering presented the objectives of Total Productive Maintenance with help of examples and activities for better understanding. All the participants took great interest in group activities slotted in the afternoon session. The participants demonstrated their newly acquired 5S working skills and also highlighted how they would be applying the skills in the actual work environment. The session ended with awarding certificates to the participants and proposed vote of thanks to all participants and concerned individuals for materializing this important workshop. 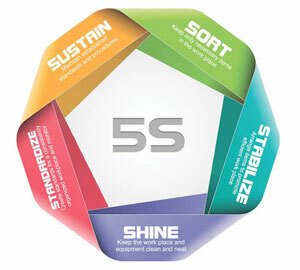 The ‘5S concept’ is a workplace organizational method that uses a list of five Japanese words: ‘seiri’ to Sort, ‘seiton’ to Set In Order, ‘seiso’ to Shine, ‘seiketsu’ to Standardize’, and ‘shitsuke’ to Sustain. The list enunciates organized approaches towards setting up an effective workspace. It employs methods such as identifying storing space for the usable office tools and an exclusive area to dispose the unusable office items. It also maintains order in the work zone, cleaning up the workshop space and the sustenance of the efficient work zone to save a time and hence a more productive work.